Skype for Business is a service that helps you stay connected to the people who are important to you, via one-touch access to instant messaging (IM), email, audio and video calls, and online meetings and presentations. Let’s go through some key Skype for Business tasks to get you started. Important: Before you can use Skype for Business, install it from the Office 365 operated by 21Vianet portal and then open it on your computer. For details, see Install Lync and Open Lync. In Skype for Business, contacts are the online identities of the people you interact with most often. They are a key part of the Skype for Business experience. One of the first things you’ll want to do as you get started using Skype for Business is to create your list of contacts. 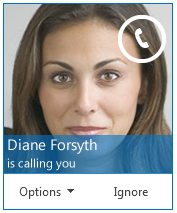 In the Skype for Business main window, in the search box, type the name or email address of the person you want to add. You can add coworkers, and, if your company has set up for it, you can add people outside of your workplace who are also using Skype for Business. 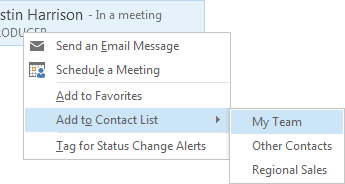 Note: For details about having contacts outside of your company, see Add an external contact in Lync. In search results, point to the person’s listing, and then click More Options. Tip: If you can’t find the person you’re looking for, try adding them by using the Add a contact icon in the upper-right corner of your Contacts list. For details, see Add a contact in Lync. Point to Add to Contacts List, and then select a group for your new contact to belong to. Right-click the person’s listing, and then select Send an IM. Pause on their picture, and then click the IM icon. Type your message in the text input area at bottom of the conversation window, and press Enter on your keyboard. Tip: You can add files and pictures, change fonts, and use emoticons or the Important flag to make your message more detailed or expressive. See Send an instant message (Use Skype for Business IM) to learn how. Before using Skype for Business to start or join a call or Skype for Business Meeting, set up your audio device and check the quality. You can use your computer’s mic and speakers or plug in a headset. 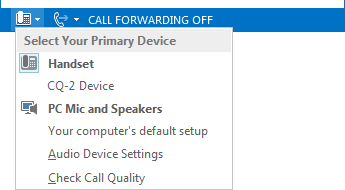 In the lower-left corner of the Skype for Business main window, click Select Your Primary Device. 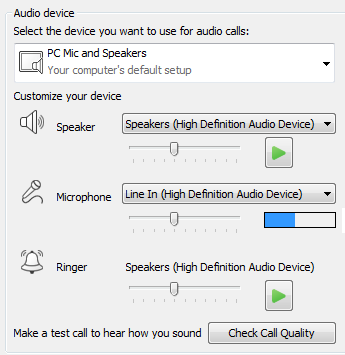 If you have more than one audio device, under Select the device you want to use for audio calls, select the device you want to use. Under Customize your device, drag the slider to adjust the speakers and microphone. Under the Speaker menu, check the speaker volume by clicking the green arrow to hear a sample tone. Speak into the device you’re using for voice—a phone or handset receiver, a headset, or your computer mic—and check the volume by watching the blue indicator under the Microphone menu. Note: For a list of audio and video devices optimized for Skype for Business, see Phones and devices qualified for Microsoft Lync at the TechNet website. Call someone for your Contacts list. In the Skype for Business main window, pause on the contact listing for the person you want to call. Tip: You can also call someone from their contact card everywhere it appears, for example, in a Skype for Business conversation window or, if you use Outlook, from an email. Just point to the person’s name to open the contact card, and click the phone icon. When someone calls you, an alert pops up on your screen. To answer the call, click anywhere on the photo area. To reply with an instant message instead of with audio or video, click Options, and then click Reply by IM. To reject the call and avoid other calls, click Options, and then click Set to Do not Disturb. To answer a video call with audio only instead of with audio and video, click Options, and then click Answer With Audio Only. Desktop sharing, for when you need to switch between programs or work on files from different programs. Program sharing, for when you need to present specific programs or files but don’t want people to see anything else on your desktop. 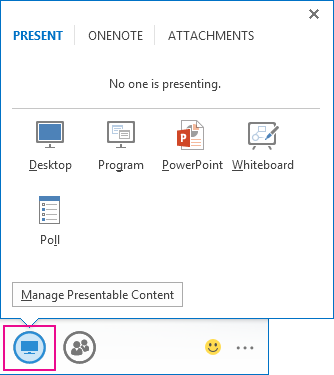 In a conversation or meeting window, pause on the presentation (monitor) icon. To share the content on your desktop, click Desktop. To share a specific program or file, click Program, and then select the program or file. 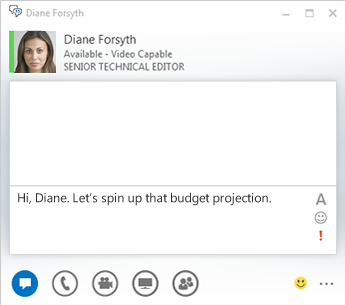 Your Skype for Business status changes to Presenting, and you won’t receive instant messages or calls. Use the sharing toolbar at the top of the screen to stop sharing or give control to participants. Note: OneNote sharing if you’re using Lync Basic. For details about Lync Basic, see What is Lync Basic?